Recently, I tried an offcut puddle. 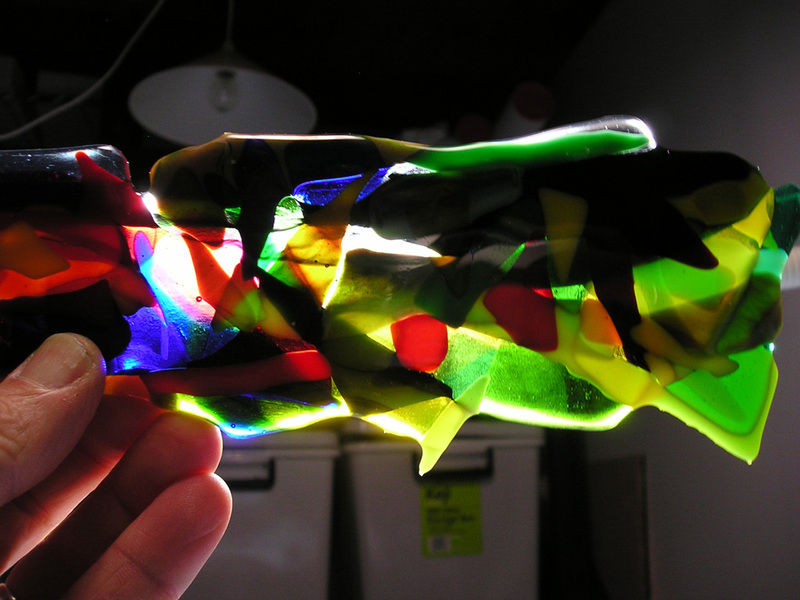 A stack of Bullseye 90 COE glass offcuts were piled up on a shelf and fused until they melted down in to a puddle. This worked quite well, but a few pieces of opalescent offcuts did show signs of devitrification. In the same firing Ann made a bar of black and white using multiple stringers for decoration. 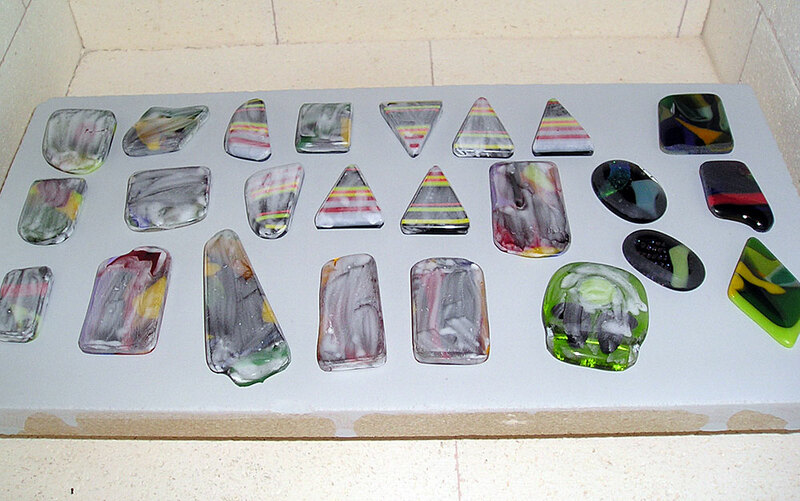 Out intention was always to then cut the puddle and bar up for cabochons. Well, I recently received a new diamond blade for my tile cutter and really wanted to give it a try, so cutting the puddle up was the perfect test. My first task was to sit down with the puddle and bar and decide just how I should cut it up. After considering the various colour tones and shapes (the photo doesn’t do it justice) I marked the cuts with a permanent marker. With the new blade installed I started cutting and immediately found the ‘permanent’ marker was not exactly permanent in this situation and was not the best solution. As soon as the water hit the glass the marks began lifting, but enough remained so I could complete the cuts. It was obvious I do need to find a better way to mark the glass. The blade worked beautifully. It cut easily and smoothly through the glass, leaving a clean surface. The old blade, the one that came with the tile cutter, was way too thick and tended to chips the edges of the cut badly. The new blade is a continuous rim blade and only .032 inches thick so much thinner. After cutting all pieces the edges were cleaned up on the grinder and using a 400 diamond pad I further finished some edges to a finer finish. All but a few pieces were covered with Fuse Master Super Spray anit-devitrification solution. These were then laid up on a prepared kiln shelf (Primo standard kiln wash), not shelf paper, and fire polished to the schedule below. You can see a few pieces on the right that look like they have not been coated in solution. Out of curiosity I decided to leave a couple uncoated to see if the grinding marks would polish out. 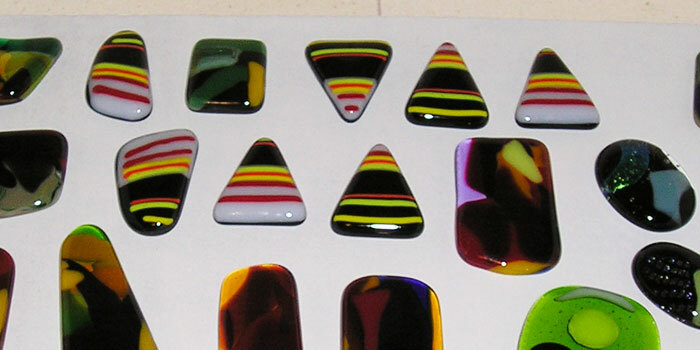 The fire polish was a success and all pieces polished to a level where they are suitable for sale. Even the pieces that were not coated polished up perfectly. This surprised me quite a lot as I half expected to see some grinding marks remaining. There was no discernible difference between the cabs with anti-devitrification solution and those without, though it certainly will depend on the glass involved. Opalescent’s being more susceptible to devitrification. Cabochons with devitrification can be rescued with some grinding and finishing with 400 grade diamond pad, and no anti-devitrification solution. 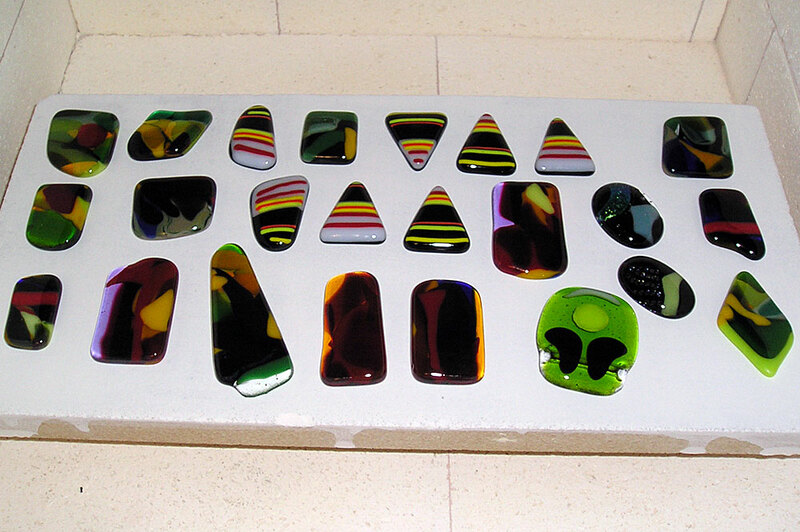 A couple of the cabochons were not the full 6mm thick but still retained their shape and thickness. The fire polish schedule is not hot enough to change the pieces substantially. Always fire polish on a prepared shelf, not shelf paper.